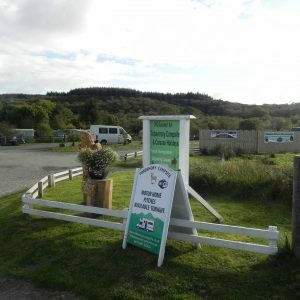 Please phone/email for availability of motorhome pitches. Advance bookings are not taken for stays of one night ,please arrive on the day and enquire for availability. Reservations for 2 nights or more are payable on booking (cheque or Bacs payment, non-refundable in the event of cancellation or reduced length of stay ), please arrive by 6pm. From November to March limited facilities can be made available if we are contacted in advance. 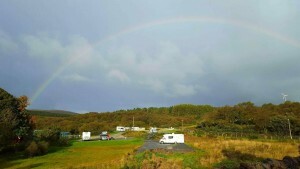 With the introduction of the Road Equivalent Tariff scheme, leading to much reduced ferry fares, travelling to the Isle of Mull has become much more cost efficient for motorhome owners. Please be aware that the majority of roads on the Isle of Mull are single track with passing places. When planning your visit remember to book well in advance – see www.calmac.co.uk for more details. 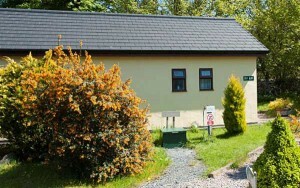 Electric hook-up £5.00 per night for camper vans and caravans only. Minimum price for Motorhome/Tourer pitch – ( Single person, no hook-up ) =£12.00. Please note – we do not have a credit/debit card facility. Cash or cheque only.